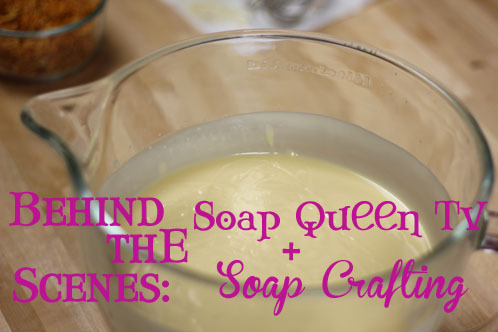 Behind the Scenes: Soap Queen TV + Soap Crafting! I’m delighted to share a sneak peek behind the scenes of the latest episode of Soap Queen TV, featuring our brand new set design. 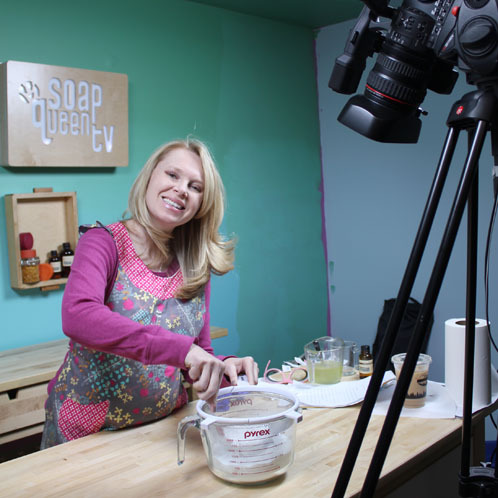 In addition, I also have news about the book I’ve written, Soap Crafting…we will be offering two FREE, exclusive Cold Process episodes of Soap Queen TV, each demonstrating a recipe found in the book, to all customers who pre-order through Brambleberry.com. Pre-ordering for the book Soap Crafting will be available soon, so keep an eye out for the announcement! We were even able to sneak in filming another regular episode of Soap Queen TV (ie: no book pre-order necessary) and I’ll give you a hint what it’s about: we loved the response to this tutorial, so we experimented with some different recipes and jazzed up the look. I think you’re going to love what we came up with! Check out a sneak peek of the final project here. I mentioned a new set design…check it out! Our Chief Marketing Maven Amber created an ombre backdrop with regular wall paint, and ingeniously hung empty Birchwood Molds as shadowboxes to display ingredients and pretty soaps. 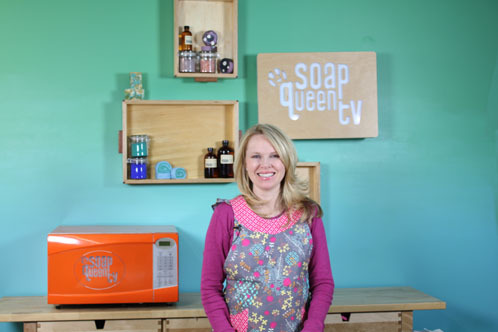 Chief Operations Officer Norman created the wooden Soap Queen TV logo that actually lights up from the inside. I think the new set turned out fabulous! Can you see the transition from blue (on the bottom) to emerald (on the top)? It was fun to revisit the recipes from the book that I hadn’t made since…yipes, the book’s photo shoot last October! There’s definitely a huge difference between poring over text, wondering if there’s enough information in each step, triple-checking recipe amounts…and the actual MAKING. But I know these recipes like the back of my hand by this point. And I can’t wait to take these two recipes from text to live action. It will be like I’m soaping right along with you! 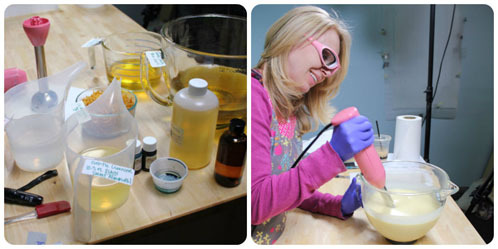 Preparation is key when filming – check out all of the carefully laid out and labeled ingredients waiting to be turned into a special Calendula bar. I just love you Anne Marie! I love your products! You are wonderful and your products are amazing! They help me make wonderful things for my customers! WOW! Nice set! It seems like you just redid the set (the purple) haha. Looks good Amber! Love the colors & the ombre. How do you do that? P.S. Can’t wait for the new bramble-baby to make her 1st SQTV appearance! LOVE the new design! Thanks for the sneak peak! Looking forward to your book! Thanks for all you do to help us! Love the new set. It looks amazing. Wondering, since you’re busy with professional soap supplies and crafting, do you ever have time to do any projects just for yourself just because you want to? wow you’re super busy! So glad you share your projects with us, so inspiring! Love the ombre background-so fun!